Here are a selection of Arun Aikido Club testimonials that we have received from students at our classes, seminars and private lessons. 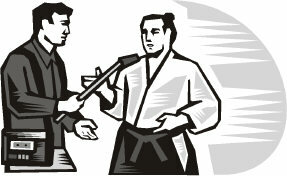 For full details about the unique training we offer in Bognor Regis, West Sussex UK, please visit the Arun Aikido Club.
" Hi Tony Thank you for hosting the Aiki Peace week session. It was a terrific evening. We all really enjoyed it. It was great to try the new warm up exercises. Look forward to the next one! All the best Piers Cooke"
"We looked at breaking our training partners balance. It helped me understand why and how they are affected, the best place to be to avoid further attacks, and allow me to control someone bigger with technique. I love training and teaching at the Arun Aikido Club because of the family atmosphere, and recommend it "
" I enjoy the wrist and arm locks, they are very helpful, and could be used in sticky situations, if practiced enough. The rolls and stretches help to keep me supple and strong. I like the Arun Aikido Club, its small and friendly with very experienced instructors "
" When I visited the Arun Aikido Club with my daughters, they were welcomed to try a class. The structure of the class is quite formal, but the instructors were friendly and patient explaining all the moves, especially to the youngest, and they got on really well. They have improved so much already. The children's class is friendly and well organised and all levels work together. It has improved their confidence, as well as their coordination and control of themselves "
“ Dear Sensei Tony just a quick note to thank you and Sensei Piers for your hospitality and excellent training evening to celebrate International Aiki Peace Week: I enjoyed myself enormously and learned a lot "
﻿﻿﻿﻿﻿Get Y﻿﻿﻿﻿﻿﻿﻿﻿﻿our G﻿raphic and L﻿ink on E﻿very P﻿age of This Popular Site﻿﻿﻿﻿﻿﻿﻿﻿﻿﻿﻿﻿﻿﻿﻿﻿﻿﻿﻿﻿﻿﻿﻿! Earn 50% by Promoting our Unique Products!